Athletic. Stressful life . I HAVE VERY GOOD HEALTH. 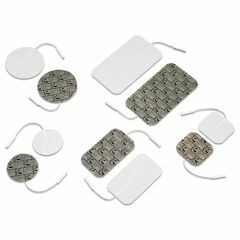 For tension use the tens pads in addition to a heating pad. Helpful for lower back pain or tense shoulders. I have an EPI tens unit and needed new electrodes. The Allegro order was exactly like the original set and very very inexpensive. Awesome product. The product functions well and easy to use. do these leads work with bio med 2000xl unit? Yes, these Electrodes will work fine. Any suggestions for quick easy way to clean/disinfect re-usable dura stick IFC/TENS pads. Drops of water on the electrode, wiping it back and forth across the electrode with your finger to clean the "sticky" side of the electrode. Also hydrates the electrode. Electrode should only be re-used on the same patient. Either tap water or a drop of dish soap - rub together under water, then let air dry. Can use them over and over at least 4 - 5 times. Will these work with a slender-tone unit? I have the same issue with skin rashes. I thought it was the silicone stuff they use on the pads themselves. I asked my chiro what they used because I never have an issue with what they use. so, I ordered the durastick to try and and so far I have had no skin rashes. These say in the description above that the pads are carbon and silicone. can you use the intelect stimulation units if you have a pace maker ? No way. Any estim device including a TENS or Intelect can interfere with the function of the pacemaker, or any electrical implant, such as a deep brain stimulator. While you might get away it with it, the risks of interfering with the pacemaker (including death) are not worth it.